My prior career was in the event/wedding planning industry. I used to bake wedding cakes, sew wedding dresses, create floral arrangements, and cater parties. At some point in the late nineties I gave it all up for coding and haven't really looked back since. Dealing with a computer is way easier than putting up with a BrideZilla. Nonetheless, I get cravings to get back to my creative culinary roots, especially the sugar iced kind. Lucky for me it's birthday/cake party season right now and I have 3 cakes in 1 week. Cake #1 is for my friend Jen's 30th. 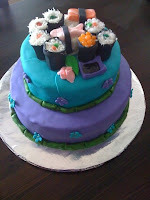 We held the party at a sushi restaurant and so what better to theme the cake with than.... SUSHI! The top was sushi created from twinkies and ho-hos wrapped and iced to look like dinner complete with hand sculpted soy dish full of "gel"-soy and fondant sculpted ginger and wasabi. Coconut rice and jelly belly Ikura and all. my daughter is doing an 8th grade project about cake baking and fondant. She has to make a cake that somehow represents her life. She might make it in the shape of a running shoe, but then she's afraid no one will eat it. 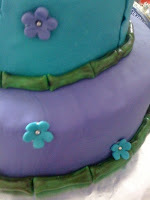 Do you buy premade fondant or make your own? I prefer to make my own. Store bought fondant sits on shelves for months and often has a chemical taste. 1. Combine gelatin and cold water; let stand until thick. Place gelatin mixture in top of double boiler and heat until dissolved. 2. Add glucose and glycerin, mix well. Stir in shortening and just before completely melted, remove from heat and stir in vanilla. Mixture should cool until lukewarm. 3. Place 4 cups confectioners' sugar in a large bowl. Make a well in the center and using a wooden spoon, stir in the lukewarm gelatin mixture. Mix in sugar and add more a little at a time, until stickiness disappears. Knead in remaining sugar. Knead until the fondant is smooth, pliable and does not stick to your hands. If fondant is too soft, add more sugar; if too stiff, add water (a drop at a time). 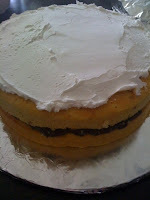 Use fondant immediately or store in airtight container in fridge. When ready to use, bring to room temperature and knead again until soft.